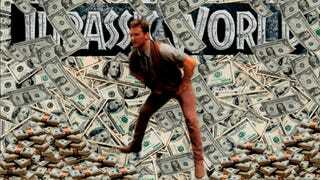 Jurassic World Sequel Set for 2018!!!!!!!!!!! That’s right, the best, most terrible movie of the summer is gonna go for another round! I think we all saw this one coming when a certain someone hopped aboard a certain helicoptor and spoke of a vague place. Chris Pratt’s oh-so-snug henley (Thank you, Jeebus!) and Bryce Dallas Howard’s high heels are set to return. So, what do we think the sequel will be called? Jurassic Continent? Jurassic Universe? i09 already predicted Jurassic Galaxy (Beware! There be spoilers at that link! ), which has excellent crossover appeal with the Marvelverse. How about Jurassic World: Extinction?! Nah, better save that one for the last installment before they reboot the whole thing and start over.